SIGMOD 2008 was the first database conference that offered to test submitters' programs against their data to verify the repeatability of the experiments published. Given the positive feedback concerning the SIGMOD 2008 repeatability initiative, SIGMOD 2009 modified and expanded the initiative with a workability assessment. Manegold, S, Manolescu, I, Afanasiev, L, Feng, J, Gou, G, Hadjieleftheriou, M, … Shasha, D. (2009). Repeatability & Workability Evaluation of SIGMOD 2009. 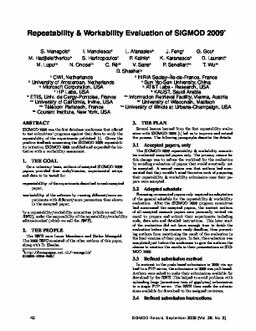 ACM SIGMOD Record, 38(3), 40–43.